Plenty of fantasy-themed video slots are available to play online, but none of them offer 6×7 reel structure with unbelievable 117,649 ways to win. 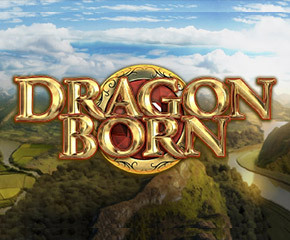 Only Dragon Born (Big Time Gaming) video slot features such an amazing platform with an impressive storyline. BTG is presenting a story of a hilly land, where the king is being threatened by a dragon. You can play this slot and defeat that dragon to save the land from his attack. The king will reward you with many luring cash prizes if you help him in fighting the dragon. So, save the kingdom and get handsomely rewarded! Big Time Gaming is renowned as one of the leading creator of the modern video slots. And Dragon Born (Big Time Gaming) represents the skills of this company. Unique storyline, unique bonus features, and appealing background are the forte of this super company. 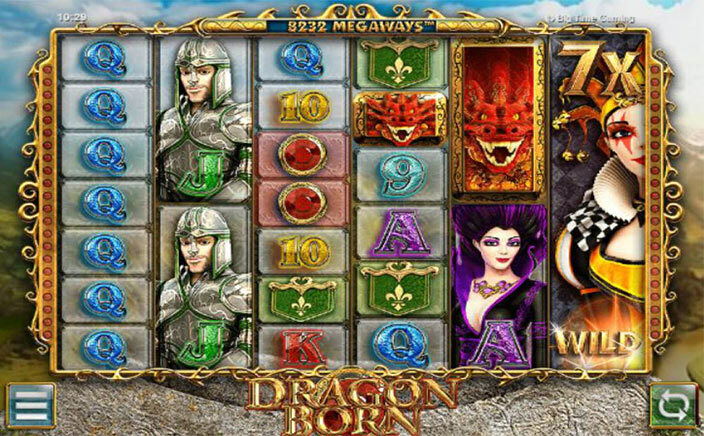 Dragon Born (Big Time Gaming) video slot is playable on all the devices including the smartphones and tabs. It has 6 reels, 7 rows, and massive 117,649 paylines. All the paylines come in action when you trigger the Megaways bonus feature. This game has a wild bonus, scatter bonus and an overall 95.00% RTP rate. All in all, it has everything which you need to hit a big win. The main symbols are based on the theme of Dragon Born (Big Time Gaming). The King, The Queen, The Dragon, Blue Gem, Green Knights, Red Gems, A Purple Dressed Woman and a Yellow Shield are a few high-value symbols. The Jester wild symbol can substitute adjacent reels symbols by wild as well. A big diamond plays as scatter, which triggers the free spin bonus feature. The fun begins when you start playing Megaways bonus feature. Every reel can be among two stacked symbols and there can be at least 7 symbols during each spin. Lucky players, who succeed in landing 7 different symbols at all 6 reels win big prizes. However, landing similar symbols on neighboring reels also offer luring cash prizes. Players can trigger the free spin bonus round by landing minimum 3 scatters. 6 free spins are awarded at the initial stage of the free spin round, but players can receive up to 50 free spins if they get 6 scatters anywhere on the reels. Playing Dragon Born (Big Time Gaming) can reward big cash prizes and enhance the credits in your account.